I find social media fascinating. There are so many ways to analyze what happens after you publish a post on LinkedIn or tweet an update on Twitter. How many people liked it? How many people shared it? How many re-tweeted it or favorited it? The list of things goes on and on. At Imagine, I am responsible for our social media strategy. For us, we’ve found that the platforms where we can get the most engagement are Twitter and LinkedIn. I read a lot of articles about best practices for social media – like how often you should post, at what time of day and on what days to get the most engagement. Here’s a post that I like from the CoSchedule blog. The author summarized several of those best practice articles I was talking about into this one post. I like best practices as they provide a good place to get started. We’re a solid six months into executing our recent strategy and I’ve been noticing things about our social media statistics that indicate that Imagine’s approach doesn’t quite fit with the norms. Upon further analysis, here’s what I found. Let’s start with LinkedIn. 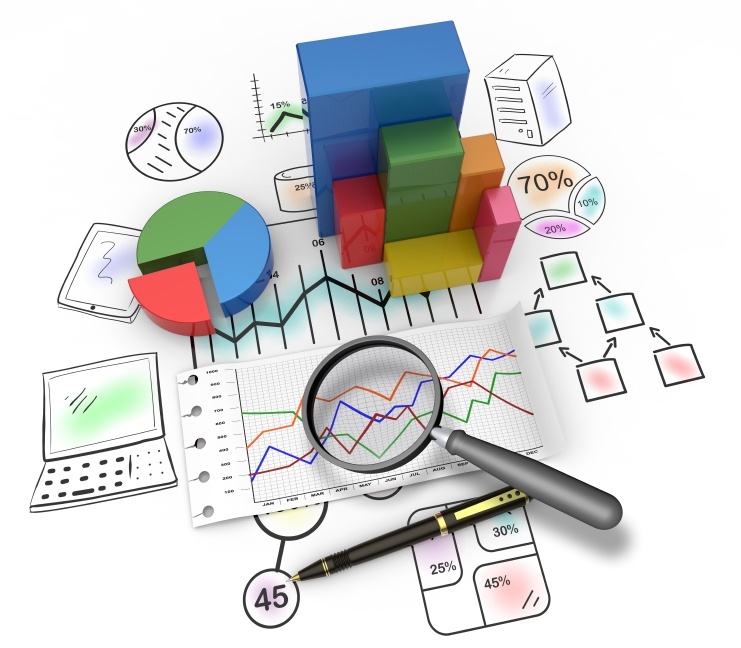 We use LinkedIn to promote our blog posts and the premium content that we create. In addition to our company page, we also post through our employees LinkedIn pages. Since March 1, 2015, we have posted 738 updates to LinkedIn. The majority of them included a photo and they all included a link. 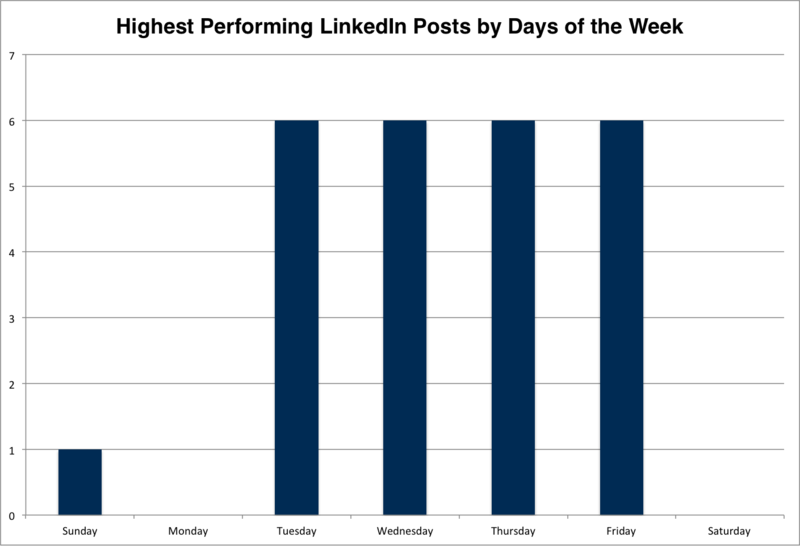 Best practices for LinkedIn suggest that B2B companies get better engagement on Tuesdays, Wednesdays and Thursdays, and that the best time of day to post is between 7:30-8:30am, noon or between 5-6pm. Most of our posts are scheduled for mornings but not always during just that hour. We also post them all five days of the week. Our actual results show that for us Mondays really are not a good choice for LinkedIn. Measured by clicks, none of our top 25 posts were posted on a Monday. Starting next week, I will avoid Mondays for LinkedIn. Friday, however, is just as good a day as Tuesday, Wednesday and Thursday. Twenty-four of our top 25 posts were evenly distributed over the four days – six each. One of the top 25 was posted on a Sunday. As far as time of day, 14 were posted between 8am-noon EST and the rest were posted between 2:00pm – 5:00pm EST. Right now, it appears that morning is working for us but I won’t be afraid to try some late afternoon posts as well. I did a similar analysis of our Twitter posts. Our Twitter approach is similar to our LinkedIn approach. We tweet as Imagine and also from our employees. We write five tweets to promote each of our blog posts and then we spread them out over approximately four weeks. Since March 1st, we have tweeted 1,724 times. Best practices indicate that, much like for LinkedIn, B2Bs should tweet primarily during the work week between noon-3pm and again at 5pm. Research shows that Twitter users are likely to engage during their commutes. My approach at Imagine has been to tweet every day of the week. I actually schedule a lot of tweets for the weekends. At first, I was pretty sure that weekends would not be strong for us but as the weeks passed, it seemed like we were actually getting a lot of clicks on the weekends. Part of the reason I decided to dive into our social media data was to determine if the weekends really were working for us. Here’s what I found. Of our top 25 tweets (by number of clicks), 20% were tweeted on the weekend. Saturday is actually the better day. Four of the top 25 were on Saturday. 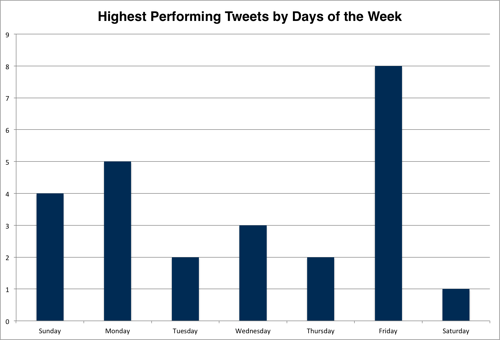 While best practices indicate that Wednesday is the best day for tweeting, Friday actually ranks higher for us. Nearly a third of the top 25 were posted on a Friday. Additionally, five of the top 25 were posted on a Monday. That means that more than half (18 to be exact) of our top 25 were posted Friday, Saturday, Sunday or Monday. So the core of the work week (Tuesday, Wednesday, Thursday) accounted for only seven. What seems to be working from a day of the week standpoint for Imagine is a little bit different than the best practices. I plan to continue to posting every day of the week. For time of day, later seems better for us. Only four of the top 25 were tweeted between 9:00am-noon EST. The rest were between 1:00pm and 8:00pm and 14 of those were between 4:00-8:00pm EST. These results are pretty close to the best practices. I plan to continue to post late afternoon and early evening. I’m glad that I took the time to analyze our posts. Best practices are a great place to start when you’re just getting into social media but it is important to gauge what is really working for you and what isn’t and adjust. You may find that despite best practices, Fridays are just as effective (or more effective) than the core of the work week for your audience too. Of course there’s a lot more than day of the week and time of day to consider when measuring your social media strategy but I’ll save that for another day.